Kyra and I obtained new license plates a couple of weeks ago, and we finally installed them the other day. Just in case anyone is wondering, WTFVQ is an acronym for the International Standard ballroom dances: Waltz, Tango, Foxtrot, Viennese waltz, and Quickstep. Our friends on the Badger Ballroom Dance Team were discussing the order of dances at a competition on the team forum, and one member thought the order was rather ridiculous, so he wrote "WTF?" 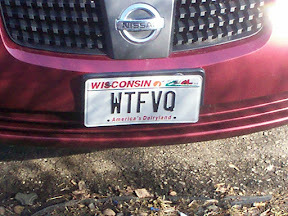 Another member, jokingly wrote, "You mean WTFVQ? ", referring to the actual order of dances. Kyra and I thought it was rather funny and that it would be a perfect vanity plate, so we decided to see if it would pass Wisconsin state standards, and it did!